I’ve always liked the color brown. As a matter of fact, Chocolate Brown was one of my wedding colors. 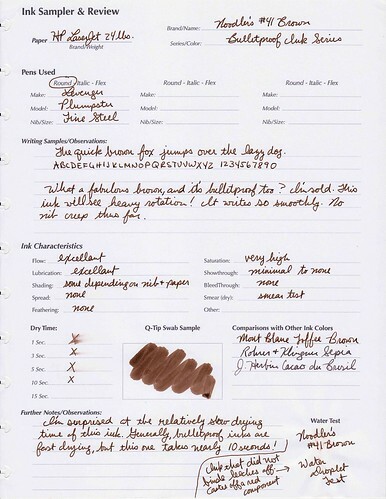 The thing is, I never saw brown as an attractive ink for writing. It just seemed a bit too drab for me. I usually prefer bright blues and purples. However, I have recently become absolutely enraptured by brown inks. It all started with MB Toffee Brown, and it’s pretty much been all go since then. Noodler’s #41 Brown is one of my absolute favorite inks, and my favorite brown ink, along with MB Toffee Brown of course. It is a rich and deep dark brown. There is a certain warmth about it, but I don’t really see it leaning toward any other color. It’s just dark brown, and a bulletproof one at that! This ink is amazingly well-behaved. There is no feathering or bleed through. The flow and lubrication are simply amazing. The drying time is a bit slow, but not terrible at 10 seconds. It actually manages to shade a little depending on the paper. It’s bulletproof! In the water test I had a little ink run off, but it was only in the areas where the ink could not bind with the cellulose. That Plumpster is a rather wet writer. For a bulletproof ink, the smell isn’t as chemically as most of the others. Since I’ve got a scanner I can also include the review sheet. I actually have one of these for every ink I’ve reviewed, I just could never get a good picture of it. Click it to view a larger size. Nice review! I love brown too – might have to add this one to my collection. 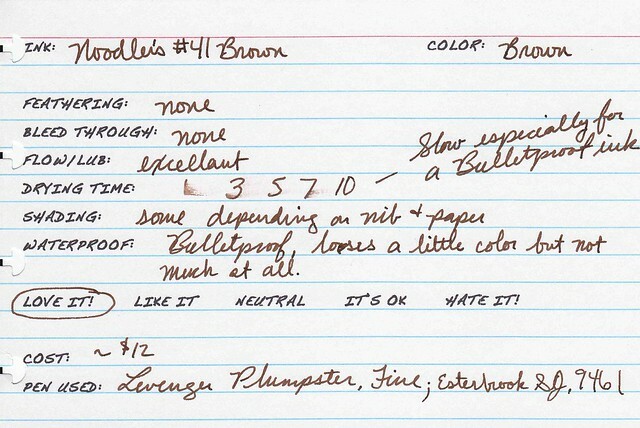 I’ve been using Noodler’s Nightshade, which is a dark purplish brown that looks especially nice on ivory paper. You’re reviews are brilliant! Thanks for taking the obviously huge amount of time to do such an elegant job. I’m literally hours away from the nearest ink shop, so the scans and information are especially useful for me. Thanks too for linking to my page.